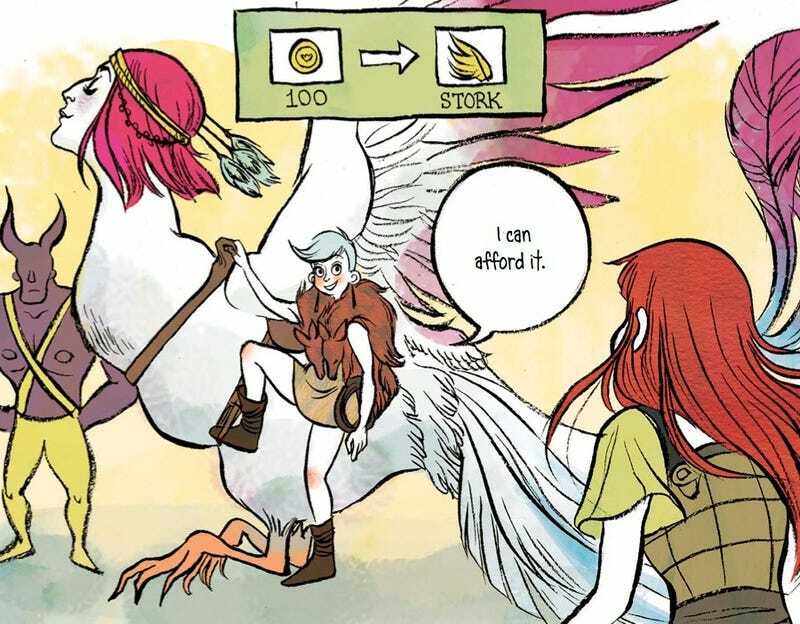 In Real Life, the new comic out from Cory Doctorow and Jen Wang, is an adaptation of Doctorow's 2004 story "Anda's Game." Ten years later, this tale of a young female gamer learning about wider social issues through a MMORPG still holds a valuable message for gamers (and non-gamers) of all ages. "Anda's Game" is perhaps my favorite of Doctorow's short stories, but I admit that I was a bit skeptical when I saw that it had been adapted as a full-length graphic novel. In addition to the prose story, "Anda's Game" already exists as an audio story, a short comic, and a germ for Doctorow's novel For the Win. But this adaptation, rewritten and illustrated by Wang (who also did the incredibly lovely Koko Be Good) is, in my opinion, the best version of the story. Anda is a young girl who already enjoys video games when she's invited to play for an all-female guild in the massively multiplayer online role-playing game Coarsegold. In Coarsegold, Anda becomes a sort of idealized version of herself, a tough and fashionable monster-killer who earns the admiration of her fellow guild members. After a while, she's recruited by a fellow player for a series of special missions: picking off goldfarmers for cash. At first, Anda views the goldfarmers as cheaters, but after she begins a friendship with a goldfarmer in China, her whole worldview opens up. As Anda begins to understand what life is like for gamers in other countries, she becomes interested in labor organization, in protecting the little guys in-game. In her offline life, Anda changes, too, both in terms of how she presents herself and how she treats others. You can read a preview of the comic over at Tor.com. We got a chance to speak with Doctorow and Wang about In Real Life, and how it fits into the current landscape of video game culture. With all of the GamerGate stuff going on right now, what do you hope that readers, especially young girls, get out of this book? Cory Doctorow: The thing that the book tries to do, and that all of the incarnations of this story try to do, is connect gender imbalance or gender inequities with wider inequities in the world. And I think that it's easy to get lost in GamerGate in the noise of the misogyny. The misogyny is a feature of much wider questions of unfairness and inequity. A bad thing that could come from the assaults of GamerGate would be for people to miss the fact that what's happened to them is part of a wider pattern that happens to people for lots of reasons: for gender orientation or racial reasons or class reasons and so on. And the best thing that could come from this is for people to make that connection and realize that their struggle can't be won until everyone's struggle is won. And so I hope that young girls are, first of all, inspired to find solidarity with other young girls, because that's one of the main themes of this book, but then to make that solidarity wider. Jen Wang: I think some of the more disappointing things I've heard from girls online who are interested in games is that they feel scared. They feel like it's something they might have been interested in, but now it just seems a little bit unfriendly, and obviously I can't blame them. But on the other hand, there's a lot of people who are trying in the whole Stop GamerGate, with the hashtags and getting the word out. People do care. Sexism won't really go away and misogyny won't go away, but there are more people on their [the girls'] side than not. So I think already there are a lot more girls getting into games, period. So I think we're on a good trajectory. Hopefully, because of all this GamerGate, people, girls especially, see people who are being supportive and will fight for them, even if right now it's a little messy. We don't really talk about it a lot in the book, but Anda is making games herself at the school. Just like for me with comics, if you read something and you feel like you have ideas, you can just totally do it now. There are so many avenues for you to just make your own thing in-house and there's nobody who can really stop you. What is it about "Anda's Game" that has lent itself to being adapted even ten years later? Doctorow: Well, I think because it's because it's a story about games, gender, labor, globalism, paternalistic walled gardens. All these are themes that are woven deep into the structure of the networked world and are issues that are still as central as they were ten years ago, if not more so. One of the things that I find really interesting in this version is the characters at Anda's school. I remember in the short story, we do see that once she becomes more socially aware globally, she becomes more socially aware at home. But I thought it was very interesting that we have that moment where she's connecting with another girl at her school. Wang: Because there were elements of that in the original short story, I wanted to keep that. A lot of the elements had changed and the storyline changed, but I wanted to keep that element of as the world changes, so does her real life. I felt that I needed to have a little bit of a mirror with the dismissive attitudes that the boys in the gamer club at school with the goldfarmers, with this rather elite sense of "These people don't belong here because they don't actually do the thing that we're passionate about." And it turns out that the girl just wanted to join in and be a part of something and build a community. And I think Anda is able to recognize that and bridge the gap between those two parties. Doctorow: Goldfarmers in China, after playing for 12 hours, relax by playing some more. The things that you do all the time you get good at, and so socializing is one of those things. I think that's something that Mizuko Ito's research and also Dana Boyd's research really bear out, that this very humane way of thinking about how young people use networks, that using networks to socialize makes you better at being sociable. It does seem that the whole message of the book is that, amidst this all, there are real human beings behind the avatars. Doctorow: In Real Life! That there is no "not real" life. That our real lives are mediated by buildings and fluorescent tube lighting and clothing made of synthetic fibers and lots of things that aren't aboriginal to the human condition, and yet they don't make our life less real. The fact that we mediate it through another layer of technology, that's not the tipping point between real and fake.